Full steam ahead! From boats to locomotives, America was built on the amazing ability of steam. For the last 50 years steam powered aircraft launch systems have rocketed our fighter jets into the open skies to defend our beautiful country. So it may surprise you that serums, masks and even peels can reach new heights when they have steam to compliment them. Take a minute to buckle your seatbelt for a fast ride because we’re about to fly through the science of steam in skincare services! Water is like a superhero! It can be a liquid, solid and gas – plus we need water to survive ? When water reaches a certain temperature (212°F or 100°C) it turns into steam. But how? As water molecules get more energy from a heat source they start to move faster and faster. Once airborne, the molecules bump against each other as the vapor turns to condensation. That’s why the process we know as steam takes up more physical space than water in liquid state. Our circulation can diminish as we age. The warmth of properly applied steam dilates blood vessels increasing microcirculation and your products penetration. Steam supercharges your skin’s superhighways to make sure clean clinical actives are able to travel quickly to where they can produce the most effective results. 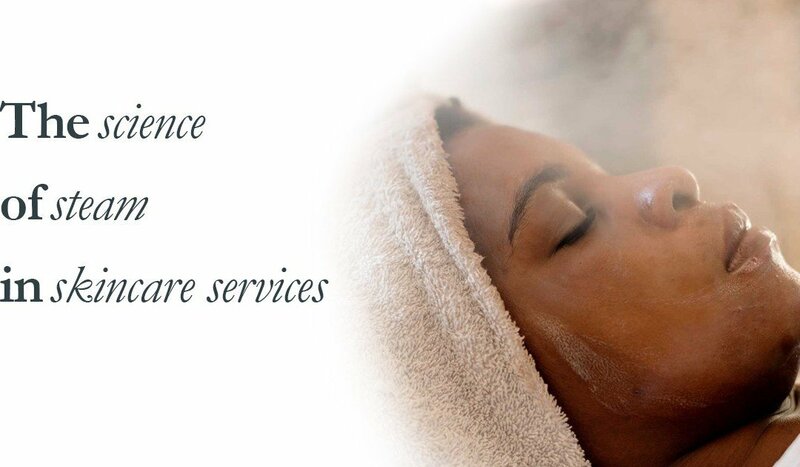 As steam goes to work it cleanses and opens up the pores on your face and body. Once the dirt and debris have been eliminated, steam frees up room for your skin’s circulation to take over. Your newly cleaned pores can now easily absorb that mask or serum you are about to apply. You brush your teeth, so why not clean your pores? There is a common misconception that steam can increase pore size, which is simply not true. The smallest pores are clean pores. As soothing warm steam starts to work on a tired face it causes it to sweat, opening pores and softening the surface layer dead skin cells. This supports the release of dirt, oil and bacteria. These could cause breakouts and would otherwise stay trapped. We recommend cleansing your skin multiple times a day. As your face goes through its natural skin cell turnover you end up with a buildup of sebum (oil/wax), dead skin and bacteria that oxidizes in open pores to form blackheads. Blackheads make the pore look larger because they become clogged. Although you can’t actually shrink the size of a pore, you can clear them so they appear smaller. We think a clean pore is a happy pore. Acne is nothing more than an inflamed or infected sebaceous gland in your skin which nobody wants. Read more: what is sebum? Hot yoga isn’t the only thing that can detox! Your normal body temperature is 98.6°F…You can figure out Celsius. Steam can raise your skin’s temperature higher than normal and puts it into a state of hyperthermia causing you to sweat. Your body then goes into overdrive and this causes more perspiration. As a result, while you perspire your body is actually removing toxins from your body through sweat! Ever been on a plane and the smiling stewardess with a pair of tongs hands you a fresh warm towel? From the second you put it on your face you immediately feel more at ease, refreshed and relaxed. The same goes for steam! People go to the spa to escape, relax, refresh and look their best. Anything that can improve a spa experience is a welcome addition in our opinion. Experts recommend a personal steam cleansing once a week. Nothing replaces the benefits or effectiveness of a professional steam machine so consider seeing your esthetician weekly or investing in one if you haven’t already. Use a cleanser that is non-abrasive for an extreme clean. Make sure to use a cleanser that doesn’t contain chemicals known to dry out your face. Just like you shouldn’t sit in a hot sauna for too long, you also don’t want to steam too much. A typical steam treatment should occur once a week and last about 10 minutes. Don’t steam your face for much longer than 10 minutes because if you steam for too long it can cause the face to swell and may also increase acne and redness. You can draw out dirt with mud? Right after a steam treatment your pores are wide open. This is the perfect time to draw out dirt, oil, gunk and environmental grime! Experts agree one of the the best ways to do this is with a clay based mask. Cleanse your hands and face and apply the mask on your newly steamed face. Let it sit for 10-15 minutes. Some clay based masks tend to leave your skin dry so be sure to use a mask that has hydrators like aloe and hyaluronic acid to combat over drying. A gentle hydrating clay mask: is your skin selfie ready? Glad you made it through without incident because steam can be very dangerous. The next time you hear the whistle of a kettle boiling think about how far ahead of the competition you are for incorporating steam into your home and spa treatments.